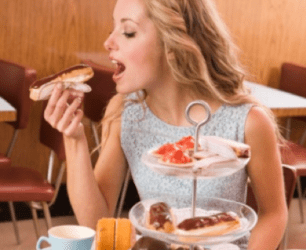 Is Your Behavioral Style Making You Fat? – Competitive Edge, Inc.
Are you a spontaneous or a spur-of-the-moment decider? Do you go to the store for one thing, and end up leaving with a cart full? Do you often struggle not to interrupt people and blurt things out? If so, you might be someone who is more prone to be impulsive, and in turn, weight gain. In a 50 year study published by the American Psychological Association*, they found that although weight tends to increase gradually with age for all behavioral styles, the greatest weight gain was among impulsive people. It’s no surprise that impulsive people are impulsive eaters and thus more likely to be overweight, but it is a bit of a shock to hear how those pounds can add up. Study participants who scored in the top 10 percent on impulsive scale weighed an average of 22 lbs. more than those in the bottom 10 percent, according to the study. Factors that can contribute to weight gain include: eating as a form of emotional regulation, binge eating and being unable to resist cravings, and those who lack the self-discipline required for regular exercise. Just because you have a tendency to be impulsive does not mean you are doomed to being out of control and overweight. By working on your discipline and creating positive habits for yourself, you can gain mastery of your impulses. * Participants were drawn from the Baltimore Longitudinal Study of Aging, an ongoing multidisciplinary study of normal aging administered by the National Institute on Aging. Subjects were generally healthy and highly educated, with an average of 16.53 years of education. The sample was 71 percent white, 22 percent black, 7 percent other ethnicity; 50 percent were women. All were assessed on what’s known as the “Big Five” personality traits – openness, conscientiousness, extroversion, agreeableness and neuroticism – as well as on 30 subcategories of these personality traits. Subjects were weighed and measured over time. This resulted in a total of 14,531 assessments across the 50 years of the study.